In Kerala, there are many hill stations which houses numerous exotic wildlife and vegetation. There are many hill resorts near the hills and all these hill stations provide a great experience to all who visit this place. The hill stations of Kerala provide picturesque scenery. To reach to the top the hills, one has to come across many curves and bends. The sight of the valleys and mountains is breathtaking especially when it is soon after a drizzle. The green valley will be covered with mist and a walk in the clouds is really enjoyable. In these hills are grown various plantations like tea, coffee, and various other spices. It is ideal for cultivating such crops in these areas. On the way to these hills, one can also find many sparkling rivers, wonderful waterfalls, springs etc. The hills in Kerala are found in the Western Ghats and are a favorite tourist destination. Many tourists visit these hill stations yearly. Hills are chosen as tourist destination by those who want to move away from the crowd and city noises and wish to relax for some time. They can also go for trekking. There are many hills which are yet to be explored. The spices grown in these hills attracted a large number of traders from all over the world. Some of the hill resorts in Kerala include Munnar, Peermede, Ponmudi, Nelliyampathy, Wayanad, Devikulam etc. Munnar is a very famous hill station which is located in Idukki district. It lies at the confluence of three mountain rivulets namely Mudrapuzha, Nallathani and Kundala. In the forests of Munnar, a flower called as Neelakurinji is found. A specialty of this flower is that it blooms once in twelve years. The mountains have a height of around 5000 to 8000 ft above sea level. Peermede is a hill station situated in Idukki district and is at a height of about 915 m above sea level. This hill station was the resting place of the Travancore Maharajas. The area is greenery with the presence of tea, coffee, rubber and eucalyptus plantation together with the pine forests. Ponmudi is a hill station in Thiruvananthapuram district. It has at a height of 1100 m above sea level and is part of the Western Ghats. The road to Ponmudi from Thiruvananthapuram is narrow. In Ponmudi there are many tea gardens and plantations of rubber, pepper etc. 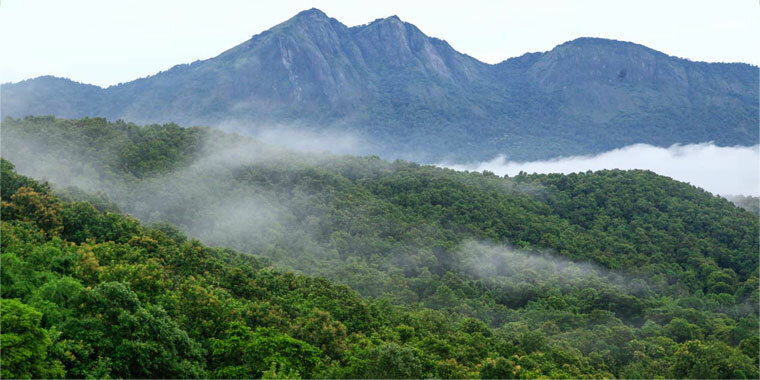 The highest peak here is the Agasthyarkoodam which has a height of 1868 m.
Nelliyampathy is a hill station which is situated in Palakkad district. These chain of ridges and valleys have height that ranges from 467 m to 1572 m. Tourists come here mainly for trekking. An attraction for the tourists while on their trip to Nelliyampathi is the orange plantations which is one of the major crops here. Devikulam is a hill resort in Idukki district. It is at a distance of 16 kms from Munnar. This hill is situated at a height of 1800 m above sea level. The lake which is now named as the Sita Devi Lake is the main attraction of this place. Mattupetti is a hill station situated in Idukki district at a distance of 13 kms from Munnar. It has a height of about 1700 m above sea level and lies in Western Ghat. It is well famous for its specialized dairy farm called as The Indo – Swiss Livestock Project.